I assured Zossou that it wasn’t the fault of the gods. There is an explanation for this unfortunate development: global warming. And I challenge anybody who denies global warming to go and see the havoc it has caused in African villages where people are dependent on nature for everything. Unless I’m a hypocrite, if I have compassion for animals, I must have compassion for my suffering fellow humans as well. If I can make sacrifices to save animals, I should make sacrifices to help the disadvantaged children in my village. My decision to become a vegan was informed by several different and interrelated reasons: concern for animals, care for the earth, compassion for the poor, and good health. I come from a little village in West Africa called Ajara, located near the border between the Benin Republic and Nigeria. My tribe, known as Gu, or Fon, is from the Benin Republic. Growing up on the farm, I was sheltered from the technologies of civilization. There were no televisions, no telephones. Everybody played and ate together. Everything was in its natural state and very green. Pristine rivers, beautiful coconut trees, mango trees, cashew trees in rich farm lands were everywhere around us, graced with colorful birds, butterflies, and all kinds of animal species. Rain was regular and sufficient. Harvests were rich, food abundant, nature's cycles untroubled. We breathed pure, clean air and ate locally grown food. To the grazing animals, the earth was kind. The thick, green forest was dense with medicinal plants. But as a child, I was uncomfortable with meat, something very rare for an African. I did not have any health issues whatsoever, but I felt incredibly sensitive to blood. As a result, unlike other children, I had a weird feeling about eating meat. My discomfort also had to do with how brutally animals were killed for food and rituals. Not knowing of any alternative way, I kept forcing myself to eat it. In 1990 my educational dream took me to Obafemi Awolowo University, about five hundred miles from my village. Shortly after graduation, I moved to Europe, and finally to the United States. Though I have always felt compassionate toward animals, it wasn’t until I came to the United State that I found out about the vegan/vegetarian movement. I was happy to discover there are active groups of people who share my compassionate worldview and feelings about animals, which are rare in Africa. Apart from concern for animals, there is another compelling reason for me not to eat meat in America: health. Though not a good choice, eating meat in Africa is safer because the animals are naturally fed without any growth hormones or chemicals. But most meat in America is laden with these artificial substances, leading to widespread cancer, premature development in kids, and all kinds of degenerative diseases. So, the decision was made: No more meat for me. But my compassion didn’t want to stop there. As I got comfortable in America, I began to think deeply about the people I left behind. In 2007 I had the joy and excitement of visiting my village with my girlfriend, Val, after being away for so many years. But was not the the pristine environment I grew up in. Some of the rivers had either receded or completely dried up. The swampy areas, home to huge snails, had turned into parched ground. Medicinal herbs were fast disappearing and the native doctors (herbalists) were deeply troubled. Wells were drying up and women had to seek harder for water. Farmers were worried and frustrated by the vagaries in the weather. Things are not what they used to be, Peter. Something is wrong. Every farmer is feeling the pain. The crops are withering away. The harvest diminishes every year. We don’t get rain anymore. Even when it rains, it’s not cold enough to bring out the Shirepepe. Remember how we used catch them as kids? It seems like those creatures are gone forever. Your children may never get to know what a Shirepepe looked like. Strange things are happening, Peter. We don’t know where the world is going. Maybe the gods are angry. The sun burns like hell these days. Even birds are dying—I’ve been seeing many dead ones lately. We don’t know why these things are taking place. 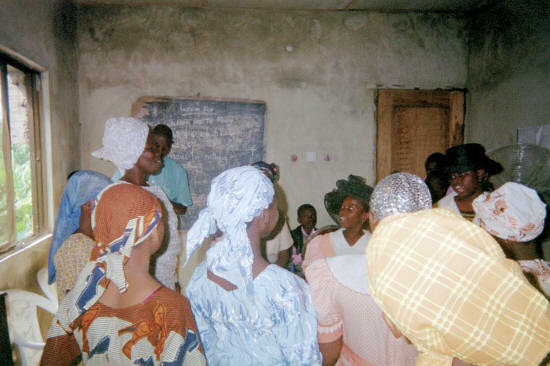 This photo depicts one of the educational projects for women that Peter is supporting. I came back from the trip with haunting images of dehumanizing poverty and wasted lives, my once vibrant village a hungry community. Thanks to climate change, the healthy people have become statistics of preventable diseases and early death. While there, I held meetings with the community to find out how best to help them. They were not asking for handouts; they wanted to be able to help their children break the cycle of poverty. Unless I’m a hypocrite, if I have compassion for animals, I must have compassion for my suffering fellow humans as well. If I can make sacrifices to save animals, I should make sacrifices to help the disadvantaged children in my village. I have promised to try my best, with the generosity of American people, to help build a resource center for the village. I am, therefore, asking my fellow vegans and vegetarians to join us. My website is The Ajara Project. Please email me for more information if you’d like to be a part of this effort. 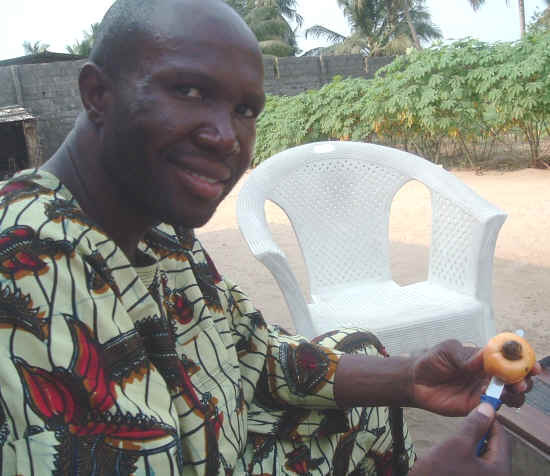 Peter Opa, an environmentalist and public speaker, lives between the U.S. and his African village, where he's committed to sustainable development and empowerment projects.